Spending the summer in Paris is a dream come true. 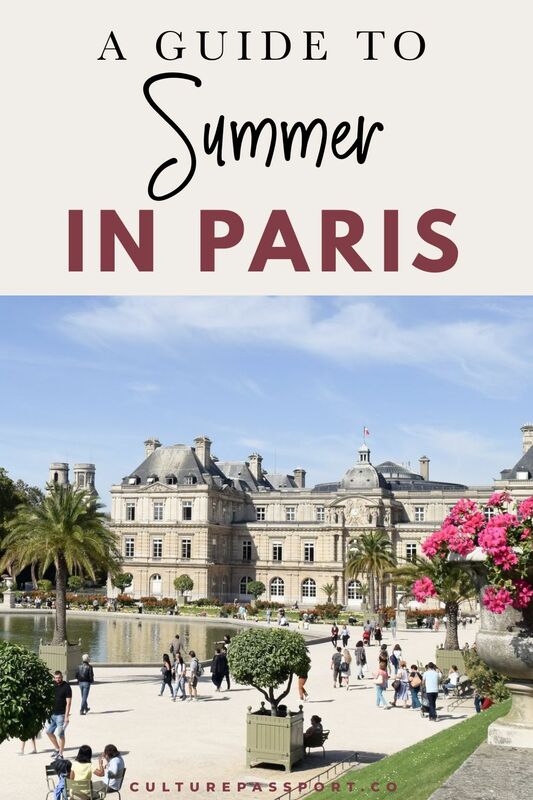 If you’re heading to Paris in the summer, then you’ll get to see first hand how the city comes alive during the warmest season of the year. You can enjoy picnics along the Seine River, makeshift beaches thanks to the “Paris Plages” initiatives, and delicious ice cream from the city’s best ice cream shop, Berthillon. Summer is a great time to visit Paris, but there’s a few things to know. Firstly, many French people take their vacations for at least 2 weeks during the month of August. For that reason, many of the city’s restaurants, shops and attractions are closed. I recommend against visiting Paris during August, if possible. Otherwise, you could visit Paris and then head to the south of France right after anyway! The daylight hours are much longer in the summer, giving you extra time to explore, but the trade off is that summer is considered high-season in Paris and lines may be longer than usual. If you visit Paris in summer, know that because temperatures are rarely extremely hot, most hotels and apartments do not have air conditioning installed. If for some reason you require air conditioning, be sure to explicitly ask your hotel if this amenity is provided before booking. It’s isn’t considered standard in France! You’ll be happy to know that there is the least chance of rain during summer in Paris! Paris rarely gets uncomfortably hot in the summer, but each year there are a few days where it reaches above 90 degrees. Most summer days you can expect comfortable sunny weather though. On average, Paris summer temperatures will reach a high of 59 °F (15 °C) and fall to a low of 77 °F (25 °C). In addition to whatever you’re most comfortable wearing while traveling during summer, I recommend bringing the following items to fit in with the locals. Wrap Dresses – Parisians love wrap dresses because they are flattering on every body type! Whether you wear a short wrap dress, or a midi length wrap dress, this clothing item is a great way to fit in with the locals while in Paris. My favorite summer wrap dresses to wear in Paris are from Reformation! Espadrilles – I love walking in my Castañer Carina espadrilles during summer in Paris. They give me a little extra height without impeding my ability to walk long distances. Trench Coat – Pretty much any season in Paris is trench coat season! You never know when it will rain (even if it’s sunny), so I always pack a trench coat or rainproof jacket with me no matter when I go to Paris. Umbrella – Because the rain is so unpredictable in Paris, it’s a good idea to bring a travel-sized umbrella with you along to Paris! If you forget yours, you can always buy a cheap one at Monoprix! Many people wonder if women can wear shorts in Paris. The answer is yes, but you will stick out like a sore thumb! While it’s normal in America to wear short shorts in the summer, in Paris, it’s a lot less common, so you’ll be immediately recognized as a tourist if you do. That being said, when it’s hot enough, I have definitely worn shorts out in Paris! Hotels with Air-Conditioning in Paris: Hôtel Le Relais Saint-Honoré Paris in central Paris, Hôtel Victoire & Germain in Saint-Germain, and Hotel Mansart in the 1st. These mid-range boutique hotels are a nice balance between charm and price. Many of them attract a creative, cool crowd making them the perfect option for a modern Parisian hotel experience. Visiting Paris in summer on a budget is difficult, but these budget hotels in Paris offer the lowest prices around. The trade off is that they are located somewhat off the beaten path – though this shouldn’t be a problem in the summer, when the weather in Paris is nice so you can walk! Now that you’ve got most of the planning down, it’s time to figure out how you’re going to get to Paris in summer! Like most major cities, you have quite a few options. If you’re coming from the United States, you will probably fly into one of the city’s two main airports: Charles de Gaulle (CDG) or Orly (ORY). Although it’s considered an official Paris airport, I definitely recommend against flying to Beauvais Tillé (BVA) airport, because it’s quite far from Paris, and not worth the headache. Plane ticket prices to Paris have been dropping lower over the years. It used to cost at least $800 to fly round trip to Paris from the USA, but these days you can find tickets for as low as $300! The major airlines that fly often to Paris are: Air France, Delta, and American Airlines. All-business class flights take off from Newark, NJ thanks to a small airline called La Compagnie. Low-cost airlines you should consider for your budget flight to Paris are: XL Airways and Norwegian Air. If you’re coming from within Europe, you could also take one of the many high-speed trains that go to Paris’ major train stations. If you’re coming from London, the easiest way to get to Paris is on the Eurostar train that arrives to Gare du Nord. The cheapest option for getting to Paris is usually by bus, but obviously you must be already located in Europe to take advantage of this option! FlixBus is a respected bus company serving many destinations in Europe. Paris offers a ton of different ways to get around the city. Of course, some ways are better than others to get around Paris in summer! I highly recommend walking as often as possible if you visit Paris in the summer. It’s the most economical way to get around Paris and offers you the best way to see the city and get a feel for what it’s like to be a local! Metro: RATP is the official Paris public transportation company. A one-way Paris metro/ ticket costs just €1,90. You can purchase a pack of 10 tickets at a discount, for just €14,90. The metro is easy to use, but be sure to look up your route via RATP or Google Maps ahead of time! Bus: The bus is a great way to see the city while traveling through it, though in my experience, it’s quite slow and is best for shorter routes. You can use the same tickets you bought for the metro to take the bus! Visit RATP to confirm the route you need to take. Be sure to validate your ticket upon boarding the bus. Bike: Parisians love to ride bicycles through the city and Velib is the company which offers easy to rent bikes to Parisians. Scooter: Electric scooters have made their way to Paris, for better or worse! Rent an electric scooter through Lime. Uber or Taxi: The easiest, but most expensive way to get around Paris is using a Taxi. Keep in mind, Uber has started requiring a passport to use their service abroad. The metro closes at 1am so you may be forced to call a taxi if you need to get home late at night. 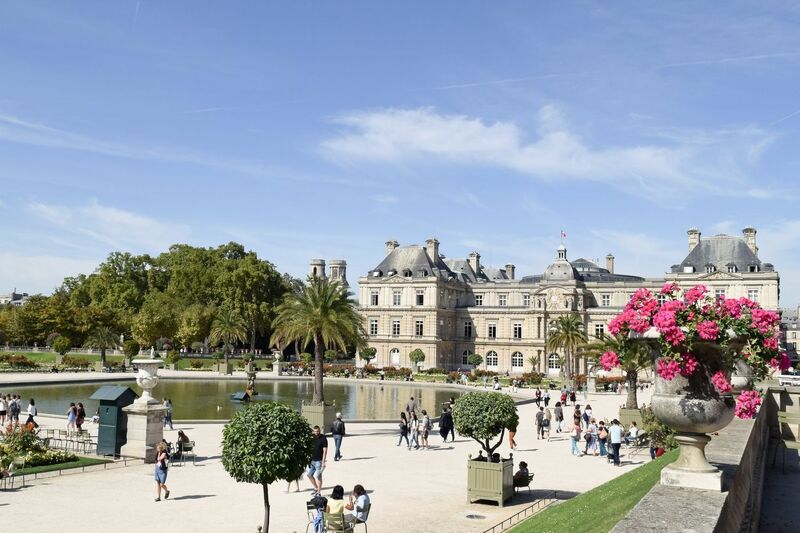 From special events held in Paris during summer to warm-weather summer activities, there are plenty of things to do in Paris in summer. Fête de la Musique (June 21) – A national celebration of music happening each year on June 21. Look out for concerts, music festivals and more throughout the city! Bastille Day (July 14) – France’s national holiday, Bastille Day falls in the middle of summer. The city will have fireworks, and public celebrations so keep an eye on the mayor’s office for announcements on what to do if you’d like to participate! Tour de France finale (July) – The end of the world famous men’s bicycle race is a highly popular event in Paris in July. Arrive early to watch the participants race across the finish line. Open-air Cinema in Parc de la Villette (July and August) – Head to the expansive Parc de la Villette each weekend to watch a different film projected outside from the grassy park. Shop summer sales “Les Soldes” (July) – Paris’ biannual sales fall in July each year so it’s a great time to buy those French clothes you’ve always wanted at a discount price! Paris Plages (July and August) – Every summer, the city of Paris installs sections of makeshift “beaches” along the Seine River for anyone to come relax and pretend they’re at the beach! Even if you don’t want to get sandy, it’s quite the site to see these beaches constructed in a major city! Journées du Patrimoine (September) – Heritage days typically fall on a weekend in September, when the city of Paris celebrates its culture by making all major monuments and museums free of charge to enter. Many programs and lectures are held, so anyone can learn more about French and Parisian culture and history. Many people want to visit Paris just to try the delicious food that France is known for. Although most French food is served warm, you can still stay cool by opting for fresh cut salads and finishing up with an ice cream dessert. You may be surprised to learn that when it comes to eating in France, things work a little differently than they do in the United States. Here is a general idea of what to expect when deciding where to eat during summer in Paris! To start off, you can buy inexpensive food at a grocery store during your trip to Paris in summer. Franprix and Carrefour are the most prevalent grocery stores in Paris that I prefer, but G20 and Monoprix are other options that could be closer to you. What you must know about grocery stores in Paris is that they do not provide paper or plastic bags for you to use to transport your groceries back home. You can always buy a reusable tote bag on the spot if needed, but try to bring your own tote bag to save money! For a higher quality food experience, head to your nearest boulangerie, which is essentially a French bread bakery that offers a variety of affordable foods from croissants, to baguettes, to quiches, to sandwiches and salads. Boulangeries are the perfect option for eating affordably but well in Paris. Most boulangeries offer what is called a “formule” or a group of things at one single price, often lower than if you had purchased each item individually. A common formule you will see advertised is : a sandwich, a dessert, and a beverage for something like 7–8 euros. This is often a good deal if you don’t have food and drinks at home! Some smaller boulangeries also do not provide a bag for you to carry your purchases, so bring a larger bag to hold them if you purchase multiple things. They also often have credit card minimums that could be as high as 10 or 15 euros, so it’s good to bring cash with you if you’re only making a small purchase. The larger chain boulangeries don’t have these issues however so head to Paul or Maison Kayser if you don’t want to worry about it. For a quintessential Parisian experience, head to a café or brasserie to eat. Keep in mind, many places called “café” serve much more than coffee. Most cafés and brasseries in Paris have a full service food menu where you can get everything from a croque monsieur to a duck confit, to pasta, to a Niçoise salad. Brasseries tend to be mediocre in terms of food quality. I also find them a bit overpriced, but you can usually see the menu and pricing posted outside before deciding to sit. Many French people go to cafés and brasseries for drinks only as they are happy to serve you wine, beer and other drinks. Most of the typically Parisian sidewalk cafés or “terrasses” with round bistro tables and wicker chairs are cafés or brasseries. I don’t usually share a list of cafés and brasseries to visit because they are literally found all over Paris and serve more or less the same food. They are a reliable option for dining and you should look for the one near your hotel upon arrival. Google Maps ratings are also a good place to check when deciding which one to visit. Berthillon Glacier is the most famous ice cream shop of Paris and a hot-weather visit is a must if you are spending summer in Paris! Other ice cream shops in Paris to try include: Pozzetto, Scaramouche, Une Glace à Paris, Amorino, and Glace Bachir. 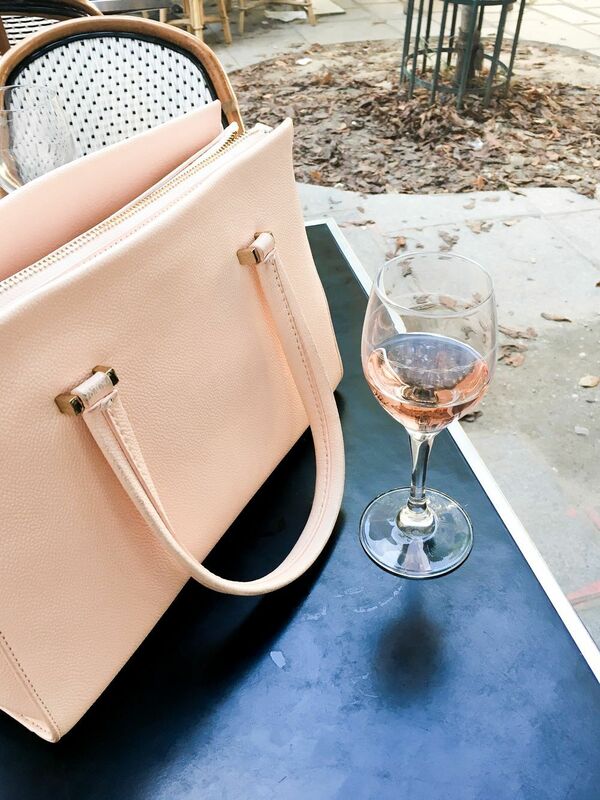 Rosé is the drink of choice for Parisians during the summer, and you can enjoy a nice cold glass of wine on almost any Parisian sidewalk terrace you prefer. Another popular summer drink in Paris is called “La Piscine.” A piscine is just a large chunk of ice that sits inside any glass of wine. The ice keeps your drink extra cold and it’s a popular thing to do during summer in France! 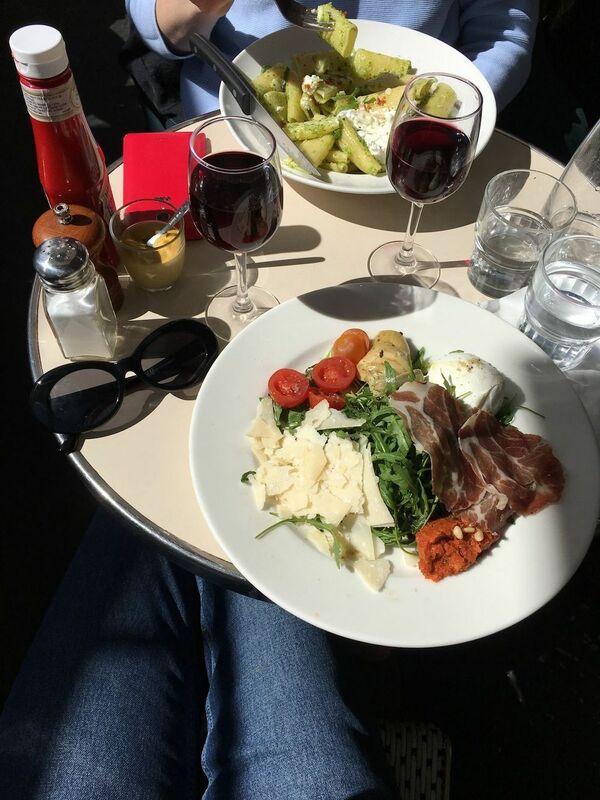 You can’t get more French than having a glass of wine or beer on a sidewalk terrace at a café or brasserie! This is what Parisians do, and each summer evening after work you will spot groups of locals huddled around a small round bistro table. You’ll also see these places busy late into the night. You have to visit the trendy Rue Montorgueil in the center of Paris at night at least once to get an idea for how popular and fun this is! If clubbing is really where your heart is, then my favorite nightclub in Paris is La Mano, a hipster club with an open dance floor and oldies music. If the weather is nice, head to Rosa Bonheur sur Seine – a floating nightclub on a boat along the Seine river! Coffee lovers may be surprised to learn that it’s difficult to find iced coffee in Paris. Drinking cold coffee is considered really bizarre by most Parisians but thanks to foreigners, coffee shops have began to adopt this favorite drink! Your best best bet for finding iced coffee in Paris is to head to a specialty coffee shop like Kitsuné Café or KB CaféShop. If you don’t mind your coffee hot, then you have much more options! The most Parisian way to start your Parisian summer morning is by sipping coffee on a typical sidewalk café, just like the French. Most cafés and brasseries will offer you a croissant to nibble on or bread with butter and jam, too! Paris has a ton of third wave coffee shops where you can sip some artisanal specialty coffee, too. These shops serve top quality drinks like lattes, flat whites, and cortados. The downside is that the majority of specialty coffee shops in Paris do not serve croissants and other typical French baked goods. They will most have banana bread or other snacks baked in-house. My favorite artisanal coffee shops to visit during summer in Paris are: Fragments and Boot Café in Le Marais, Café Kitsuné followed by a walk through the Palais Royal, KB CaféShop in Montmartre, and Passager in the 11th! Summer in Paris means the bi-annual sales are on! For six weeks in summer, nearly every store in Paris has marked down their spring and summer merchandise in a period called Les Soldes. You can snag great deals during the summer in Paris so it’s a great time to do some shopping if that’s your thing! Even if you’re not looking to revamp your wardrobe while in Paris, there are plenty of shops for you to pick up souvenirs and cute gifts for family back home. The major department stores in Paris are Galeries Lafayette and Le Printemps in the 9th, Bon Marché in the 7th, and BHV in Le Marais. Department stores in Paris are your best bet for finding the widest selection of fashion, gifts, accessories, suitcases and more in Paris! For the latest contemporary French fashion boutiques in Paris, head to Le Marais, the city’s trendiest neighborhood when it comes to finding unique pieces from independent designers. My favorite French fashion designers are: Sandro, Comptoir des Cotonniers, Saint James, Mirae, Sézane, and Figaret. Paris has seen an influx of new handbag and leather goods designers, each of which have their own unique style. These shops are a great place to find on-trend handbags that none of your friends back home have! Be sure to visit Léo et Violette, RSVP, Polène, and Olivia Clergue. For cute gifts in Paris that don’t come from a Made-in-China tourist trap, check out the following authentic French shops for unique items to take back home: Merci in Le Marais, Mariage Frères for gourmet French tea, Maison Brémond 1830 for cooking supplies, Pierre Hermé for delicious macarons, and lastly, CityPharma for discount French beauty products. Enjoy your summer trip to Paris! Lastly, it’s time to enjoy your trip to Paris in summer! Let me know your tips and suggestions for visiting Paris in summer in the comments!